Guess what? I found so much to get excited about fall’s accessory collections – and I count footwear as a major accessory – that I’m skipping over spring. Besides you’ve probably done whatever shopping you plan on doing for the season. 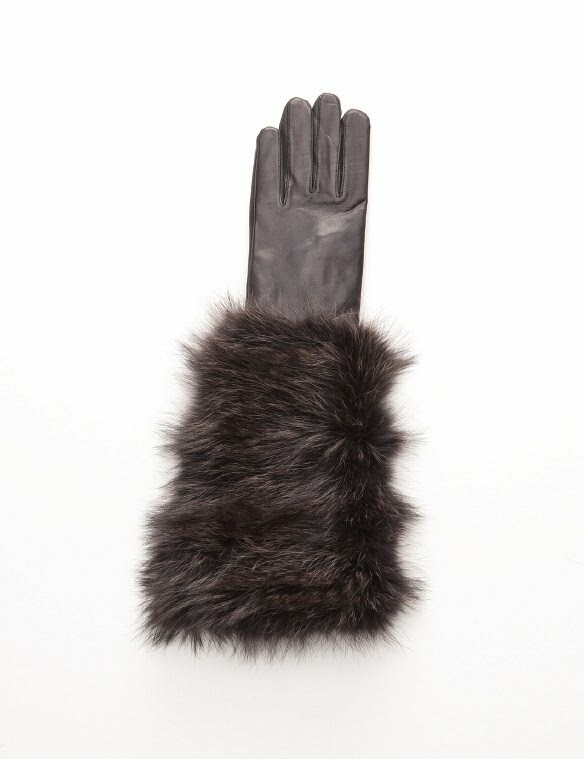 Heck, since the weather’s been so lousy I haven’t even had a chance to get out of heavy boots and forget about carrying a great handbag in the snow. So here’s the story about fall trends. Look for structured and framed handbags, clutch bags, contrast colored details, glam embellishments for late day, textural mixes and half flap east/west styles, messengers and cross body bags and hair calf oversized handbags. I adore jewelry and this season there is much to love, from geometric, oversized pieces to resin cuffs and bangles, burnished metals, wood and leather combos, raw rocks and stones,, multi-layered beaded chokers and much more. 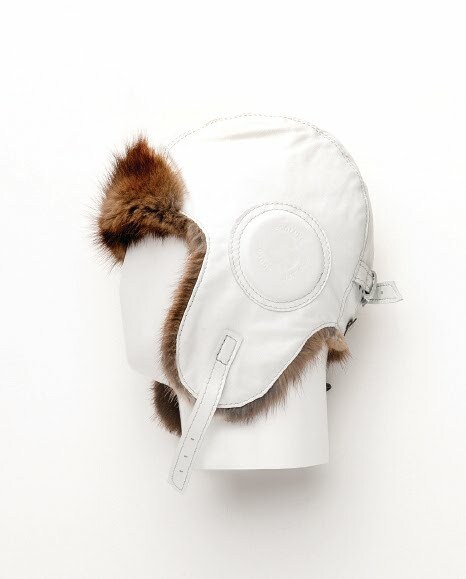 Since I really don’t give a hoot about scarves, gloves, belts etc. (yes we all wear them but frankly I don’t feel that there’s all that much to say about these “basics” when we could talk about the best looking shoes and boots, my personal fave category. Yes, there are still platforms out there and the ubiquitous ballet flats, but taking the lead position are the variations on the classic oxford in every permutation and price point and the boot, from the rugged Ugg-look, to perfectly polished knee high variations on the riding boot. You definitely won’t go barefoot next fall and winter. Harricana - So Good C&C Pays Retail! LIA SOPHIA’s jewelry collection is not for the timid. Her bold cuffs and necklaces from the “Industrielle” range were standouts. For some reason my first impression was a combination of strikingly modern designs with a deco (think of the movie Metropolis) edge. 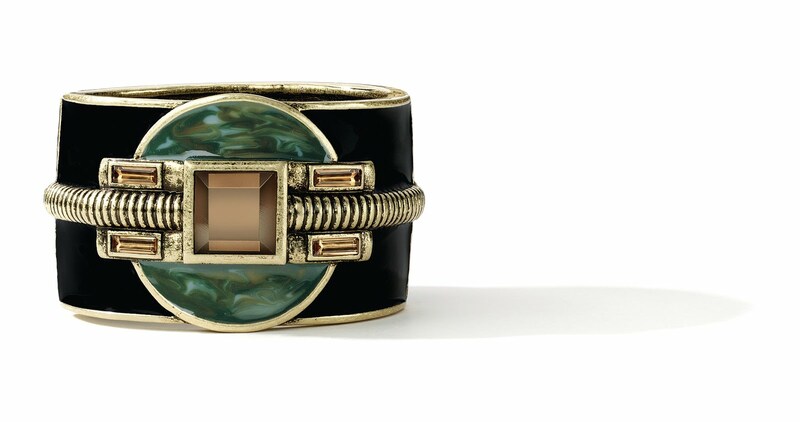 The tier hinged cuff bracelet with smoky crystals and jet and moss green enamel on matte gold captures this mood perfectly. For more info on Lia sophis go to www.liasophia.com. 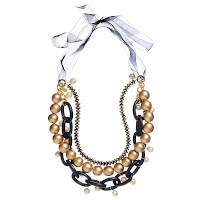 AMANDA PEARL was recently awarded the coveted Fashion Group International 2010 Rising Star Award for Accessories so you know she’s doing something right. 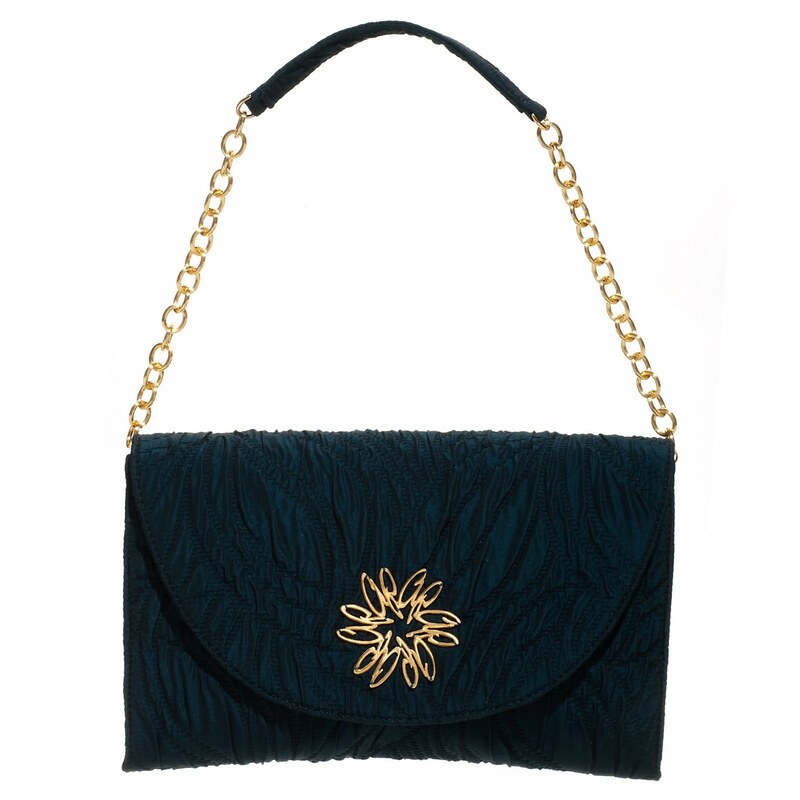 The collection consists of jewelry and day into evening handbags. In the latter category I fell hard for “Salish” a limited edition clutch in velour, angora and shimmer black metallic stripes on flat blanket stripe wool. Decorating the front flap is a gorgeous lacey gold logo medallion Included is a removable textured gold chain shoulder strap. 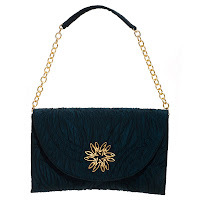 This sophisticated bag could have stepped right out of the pages of Vogue circa 1950’s. 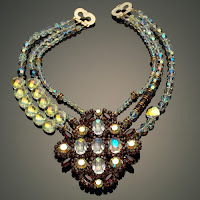 My pick from her jewelry collection would have to be the three strand wood with vintage pearl necklace on an adjustable organza ribbon but there’s lots more I could mention. Find out more at www.amandapearl.com. 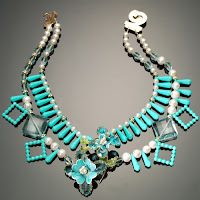 SUMARIS is a brand new jewelry collection that melds eye popping flamboyance with vintage materials. 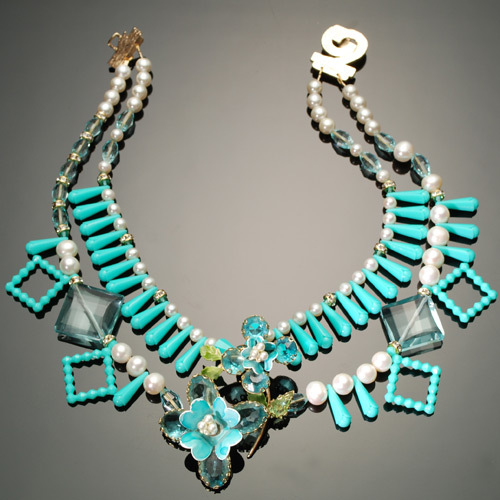 Imagine Swarovski crystals, African brass rhinestone buttons, sterling beads, opalized quartz, enamel findings and more and you get the idea. 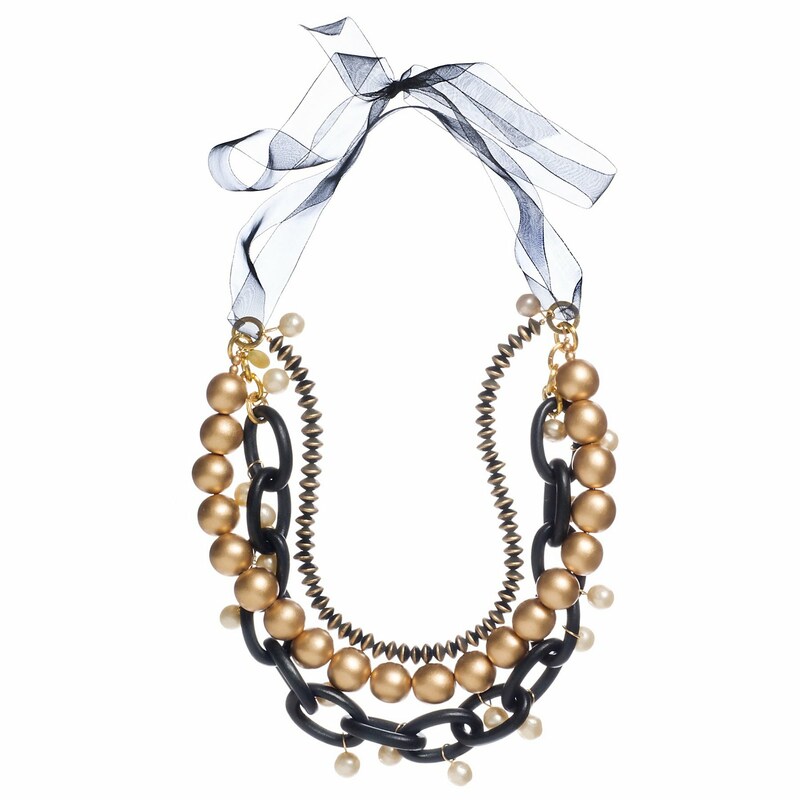 The most striking are the one-of-a-kind necklaces that will up the fashion quotient of any little black dress in your closet. Not cheap but worth every penny if you want to be noticed. Go see at www.sumaris.com. HOBO is a handbag line that’s been around for ages and the customer base keeps getting stronger every year. Funky, sporty and affordable is the idea here. And I’d opt for any one of the slouchy numbers, especially the cross-body gem in soft black leather or the large fold-over clutch in bright orange. BIVIEL was a name I had not heard of previously. And I thought I knew all the footwear brands out there. Turns out that this company makes some of the most funky ankle boots around st prices that won’t stun you, Heel heights range from short stacked to a solid three inches or so and some have wedge bottoms. There’s all kinds of details from elastic inserts to lacings, criss-cross straps and buckles. The overall look is boho chic for cool girls of all ages. MORENATOM is another footwear collection that has a definite earthy, boho vibe. It’s unique combination of simple rugged designs with a sophisticated mix of vintage upholstery textiles, distressed shiny and dull leathers that make this brand a winner. 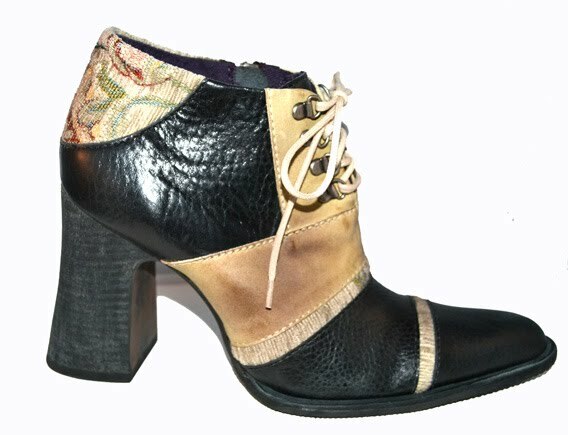 I’d check out the tri-toned/textured wing tip “Stella” distressed calf oxford perfectly balanced on a stacked heel or “ “Luli”, a lace-up ankle boot with side zip in distressed spotted suede. FRATELLI ROSSETTI has always been a favorite designer footwear line of mine. In all honesty for fall/winter they’ve exceeded my expectations. I really could have walked off with every shoe and boot in the collection but I’d settle for any one of the gorgeous two-tone suede oxfords and the spectacular knee high leather riding boot in a gorgeously unexpected shade of green. Who knew that this color could turn out to be a (necessary, in my case at least) must have wardrobe staple. Start saving those pennies now. There isn’t a dud in the collection. JUDITH LEIBER is known for her elegant designer minaudieres but equally striking is the jewelry collection. The line features impeccable craftsmanship and attention to detail. Her stuff is the next best thing to the real McCoy. 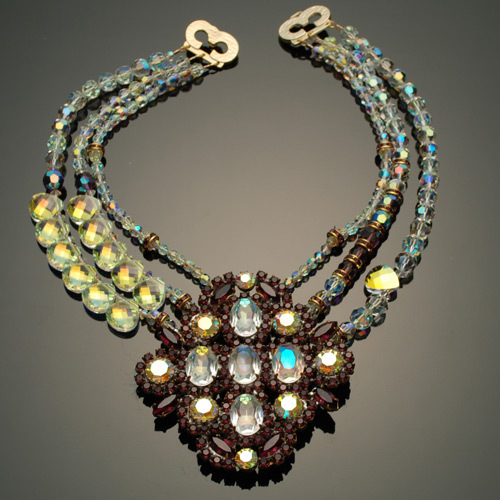 The “Maharaja” jeweled necklace with amber Swarovski crystals and gunmetal finished chains is major bling but if that doesn’t work for you, go for any one of her rhodium finish cuffs with crystals and enamel. My fave is the bold “Deco” cuff. REBECCA MINKOFF’s rtw runway collection left me less than thrilled but her handbags were a standout as always. For pre fall there’s much to drool over. Tops on my list, the woven leather mini satchel and a diamond quilt Italian leather schoolboy satchel. GIANNI RICH offers a fresh fashion oriented take on the classic Ugg boot. Some styles have buckles and chains (a major trend for fall) while others feature sweater cuffs, fringe, “fur” trim, buttons and spatter effects. 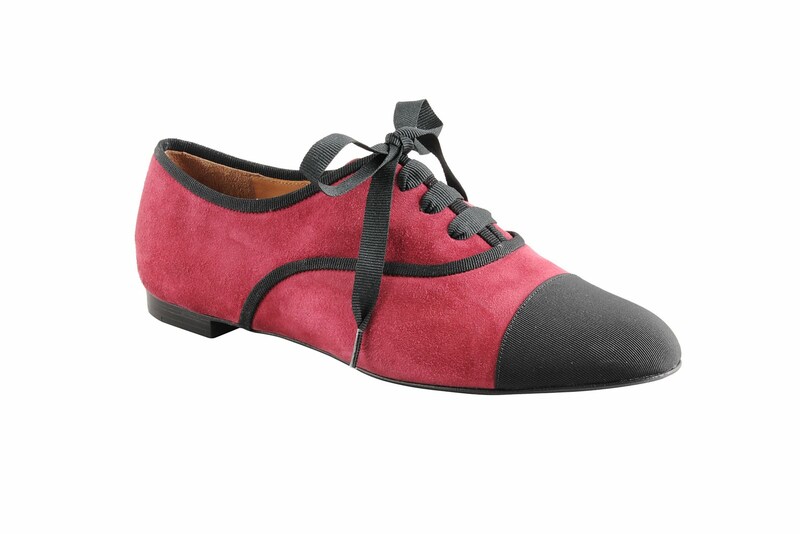 Also cute and very cozy are the sheepskin lined ballet flats and even a pair of animal patterned Mary Janes. CHINESE LAUNDRY is a well known footwear brand that taps into all the major trends at very friendly prices. Out of fall’s extensive collection I’d definitely buy “simple times”, a waxed buffalo high heel platform penny loafer and any one of the split suede multi strapped rugged ankle boots. You can find this line in all major department stores. So there you have it, my personal choices for the best of the best in fall accessories and footwear…I have spoken!